Some time ago, there used to be a recurring article in one of the bolt of industry periodicals that came across my desk. The editors would pick some pseudo-celebrity or high profile chef… and poke around in their refrigerator. 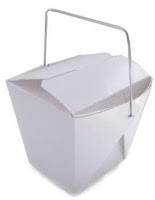 In voyeuristic terms alone, it was a opportunity to peek inside the private lives of kinda public people and chance seeing a half eaten celo-pack of Ho-Ho’s nestled next to a carton of quail eggs… a myriad of take-out boxes, and a truffle… a half-eaten Costco chicken and a block of Maytag. Who the hell eats like that. One of the food communities I belong to sent out a call for their publishers to come up with and blog about an economical meal with only the things you already have on hand in your pantry. That got me looking at what I actually keep on hand. 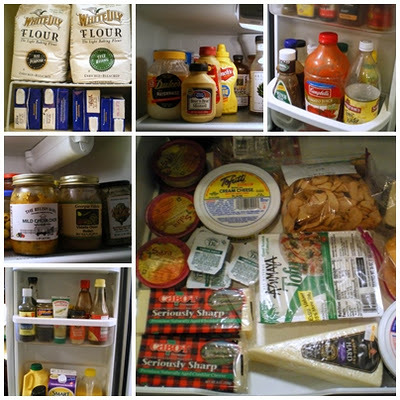 I realize that a lot of singles, or couples even, don’t back stock a lot of groceries. And that a meal designed from whatever staples you might have could be a benefit. But I’ve been broke… and I’ve been poor-ish. And I know what happens when you aren’t diligent in keeping your back stores up – You find yourself eating graham crackers with strawberry jam and peanut butter on Thanksgiving. … And believe me – there’s no amount of creativity that will make a glob of cracker encrusted peanut butter look like a turkey. 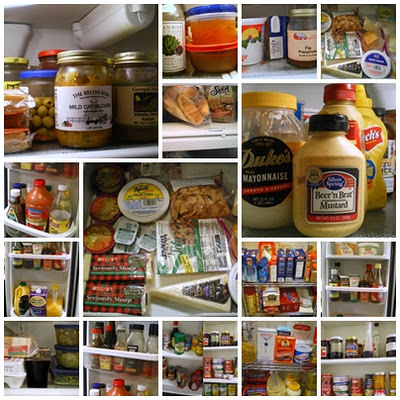 Suffice it to say, I now keep a well-stocked fridge and pantry…. I could outlast Armageddon. So, call me a snob… but I didn’t play in the cook what you have on hand game. I can always pull a meal together from what’s hanging around in our stores. I learned from the best. With four ravenous kids and a hungry husband in tow, my mom could work magic with a can opener and a bag of rice. So.. the fridge raid. I decided to poke around in our fridge and tell you what I keep on hand. Yes.. it’s self serving…. Yes.. it’s a little embarrassing when I actually put it down in print… and Yes.. feel free to make fun of the mess all you want…. I keep 3 to 4 different types of mustard at all times. I like yellow for hot dogs, brown for sammiches, and German style when I need to burn my nose hairs. Mayo is Dukes. It used to be Kraft, but they did something bizarre to the formulation and it turns watery after it’s been open for a week. There’s a 1/2 bottle of Brianna’s French Dressing, a bottle of Marzetti ranch, sesame and balsamic dressings I use for marinades. Pickles and olives – one of each. Bread -n- Butter, Dill, Kosher, Cornichons, stuffed pitted olives and calamata. I’m also a sucker for relish, so there’s usually a chow chow, onion relish and a chutney there. Jams and Jellies – a jar of Minneola Marmalade, Stem Ginger (preparation below), Frog and Fig preserves, Strawberry Jam and Apple Butter. Condiments – Soy Sauce, Sticky Soy, Fermented Black Beans, lemongrass in a tube, fish sauce, sesame oil (toasted and plain), Maggi, Worcestershire Sauce, liquid smoke, sesame seeds, rice wine vinegar, three types of chili sauce, Ketchup, Chicken and Beef Stock. Eggs – 2 to 3 dozen at all times. Omega 3… preferably Eggland’s Best. Pre-prepared foods: some kind of cooked protein (pot roast, cooked chicken) A fully cooked entree, veg and starch for a last minute meal if needed. Bread – a pack of English Muffins, Tabouleh Rolls ( a dairy free crescent -style roll), Individual packs of Buttermilk Waffles (lactose free), a zipper bag of corn muffins. Cottage Cheese – Lactaid lactose free version. Colby Cheese – I know...but it makes the best cheese toast. Convenience packs of Tartar Sauce and Hummus. Wine – Dry white and champagne; a beer; tonic water; caffeine free Diet Coke (it has that grab your throat bite where Coke Zero doesn’t); Lactose Free Milk, Buttermilk, Tomato and Orange Juice, Lemon Juice, Yuzu Juice and currently – Flying Dragon juice. One package At least of each protein – beef, chicken, pork, fish. (I will buy larger cuts of beef and pork, then cut them down to 1 pound portions before freezing. That usually nets me 3 – 1lb roasts and a couple of packs of stewing beef. For chicken, I buy the family packs and break them down into individual meals. So between beef and chicken alone – I have 10 days of protein for 2 people) And, It’s less temptation on 2 people to overeat when there is less meat cooked up at meal time. A left over whole Chuck Roast Pot Roast wont last 2 days in the fridge if its just sitting there….calling me. Semolina Flour, orange zest, lemon zest, dragon zest – lemon juice ice cubes. 3 loaves of dressing, a bag of generic ravioli and budget meatballs. Here’s the Preparation if you want to make your own Stem Ginger (Ginger in Syrup) It makes for a quick gingery addition to any marinade, add it to something acidic and a little oil and you have a quick dressing, add 2 tablespoons to a glass of club soda for killer homemade Ginger Ale. 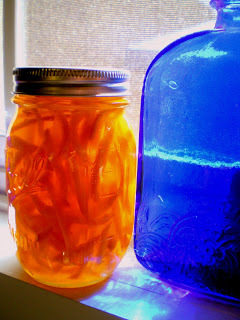 Pour into sterilized preserving jars and seal. The ginger will last in the fridge for about a year – and on the pantry shelf for about 6 months. Your fridge is a treasure chest of amazement. I wish I had that kind of a stocked fridge, but if I did, much would turn green and moldy before I could possibly eat them. 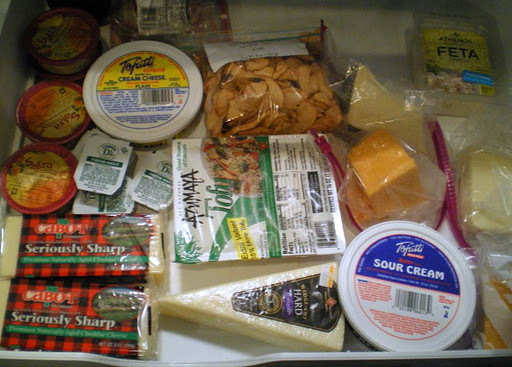 As a result, my fridge is currently a wasteland of emptiness – a vertiable food desert in my own home. Today, there’s definitely a meal or two in there, but I’m not sure I’d want to eat them; other times, it’s deliciously stocked. 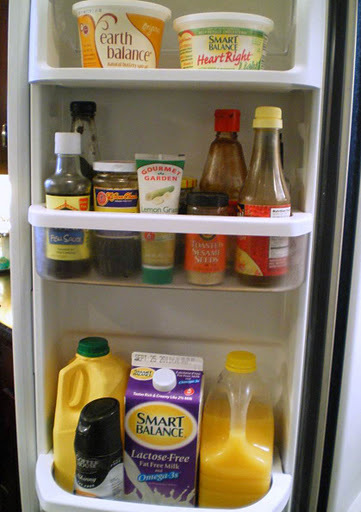 And the NPR show Splendid Table has done ‘fridge raid’ segment several times; the callers tell the show host three things in their fridge & she creates a recipe on the spot. I just took stock of my fridge, freezer, and cupboards last weekend! This in an atempt to get more organized. The checklist now sits on the front of the fridge to help with making lunches and dinners…as long as everyone crosses items off the list when it is empty! Even then, I still get this little nagging voice in the back of my head…'if I just run to the store, I can make….' 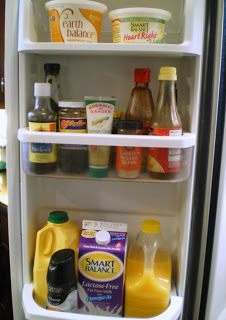 Oh, and I tossed all the expired salad dressings! I'm sure not as brave as you! The good stuff includes Trader Joe's raspberry jam; (it's very good, I've only used a wee bit, stemming from self discipline,) real butter; lots of eggs, too; tapenade; sriracha sauce and many other things I'm ashamed to admit.